The Jewish bride cries under the wedding canopy. The little Jew who dances does not lose the memory of his misery; by dancing he mocks it and accepts it as his divine lot. If he sings, he sings with sighs; for he is penetrated with the past sufferings of his people and his soul is bathed in the prophetic awareness of the unimaginable sufferings that are reserved for it. Did not God forewarn them about it? Did not God take the trouble, something he did not do for any other people, to tell them through the prophet Isaiah, through Jeremiah and the other great voices of the Bible, about the purifications that his love reserves for them? They know all of these things, those Jews who have not given themselves over to the secular world, but are bathed each day in the living waters of the Scriptures. They know these things, the Jews of Chagall. And then it dawned on me that the experience of Raïssa’s forebears is universal to those who have inherited the same history of struggle in grace. And it is universal to matrimony as sacrament. The walk up the aisle is not a singular experience. It is once the walk to the altar of sacrifice, and always a walk towards the altar of sacrifice. The culture may not like it. Some in the Church may not like it. But anyone who enters into matrimony we call holy, must know it. Being married nowadays requires a defense, you see. It is no longer enough to simply be married. We must be capable and ready to make a defense for the choice we have made. First to ourselves. Then to each other. Then to the culture around us. And what defense is mine? The answer to this is the telling tale of a love born of struggle. It seems clear that the daily business of married life is difficult before it is delightful. We are talking here of married life that is consecrated. We are talking of holy matrimony. Ordinary human friendship has its many joys. The companionship that elicits delight, and slowly turns to love, and finally to consecrated spousal union, is a joy given to the human race from the time when God told Adam that it was not good for man to be alone. But as it is not good to be alone, it is also not easy to be together. Which begs the question: what keeps marriages alive? What is the glue that binds? You look at these couples married fifty years. You see one dancing around a hospital room to cheer a spouse who is bedridden and dying. They smile as if they were youngsters on a park bench, or newlyweds walking down aisle at twenty-three. Unthinkable these days, but now half a century of love later they live out a witness to the possibility of faithful life together. Theirs are joys that will not die even in the night of sorrowful partings. Surely they know something of what it takes. Yes, the answer is love. A love they treasure and believe possible — unconditional love. Fine. We will listen. Watch them. We shall learn. And then you see the young ones, married two years and on the brink of separation. Or divorced with two kids and about to turn thirty-four. And they still believe that matrimony is holy, and yes permanent, although theirs is broken. They know something of love too. That it is beautiful. And so difficult. And then there is the rest of the culture that says we should simply fall and always try to feel in love — a standard so low, it is good simply as a point of contrast. If it is to last, love will be tested. It will be hard. No model exists for easy love. If marital love is the fullest expression of human generosity that can make of two one flesh, then it comes at the standard of lifelong sacrifice and perseverance. Generosity entails an offering — one possible even in weakness because it is supplanted by grace. And this is the tipping point between any marriage, and the sacramental reality of holy matrimony. We must be capable and ready to make a defense for the choice we have made — the choice to walk up an aisle and ask to be given another in trust before God. Because the time will undoubtedly come when doubts prevail over early joy, and sorrows rend the bond thought unshakable. Because it is so easy to break union, and fragile unions break. Because it is always hard to truly love. Because all the encouragement one gets these days, is the encouragement for the failure we superficially call liberation — the deluding encouragement to feel good about failing, which comes from the prior despair that heroic love is ever possible. Because holy matrimony bears the imprint of love born of struggle as epic as that of people of Israel, and ultimately as salvific as the one of the Christ who came in the flesh to redeem the fallen children of Eve. That still night I looked out a window onto a skyline illumined by city lights — against a dark horizon, a coral glow feigned the day. I yearned for a new realism — the truth about what makes holy matrimony what it is, and what it takes for it to be possible. In that illusion of daylight, emblematic of pervading confusion, I thought of all those about to approach the altar. I envied them. Still, I thought, they have the chance to learn this and prepare — to make a choice of eternal consequences for which they have a bold defense. A defense they can return to in the sleepless nights that will surely come. Would that someone help them. And then I thought of all those who now find themselves appealing to the vow that is made onto eternity for the courage to persevere. How I hoped that they could, would speak of what it takes to carry on amid the storms that assail those sacred promises. And fight boldly, always, for the reason of their hope. No way of life is void of struggle and sorrow, I thought. What, where, is the reason for our hope? On the windowsill was a rose plant in a pot, buds awaiting the glow of morning light — a kind of secret garden placed perfectly above a skyline, inviting a gaze of contemplation. I yearned for the day when we would begin to look also at the thorn that protects the rose. Sorrow can only make sense when it is lived in the knowledge of a greater hope. The rose and the thorn are on one stem, anchored to one another. Human sorrow and human love are entwined. How I wish we could be honest about this reality with ourselves and with a waiting world. What we call a rose has its crown of thorns. The best defense of marriage, my defense, is a defense of reality, of truth. We have been given to believe in the unreal. That love is all pleasure and no pain. That we should have what we want. That we have rights that precede responsibilities. That loneliness is unlivable. That freedom is easy and entails liberation rather than sacrifice. That when we fall short, and sometimes fail entirely, we should be helped to feel good about our failure — no guilt, no judgement, no regret. But holy matrimony either turns this anti-realism around, or itself falls apart. The reality is that marriage is a good, and goods are to be treasured and nurtured, not measured. The truth of guilt is that it indicates a loss and a need to restore. Love will only grow and ‘feel right’ insofar as it is wed to virtue. Love grows as virtue grows. Virtue has consequences, life-altering consequences in the people who choose practice it — who are always capable of it. Love is strengthened only as one desires one’s own holiness, and then that of another. This is the truth of holy matrimony: that we are charged with providing for another the same care God has for us. We are given the opportunity and the noble responsibility to desire for another what God desires for them and for us — happiness and salvation. Holy matrimony, then, is a participation in the redemption of the world. The truth of redemption is that it requires everything. We have lost a sense of this reality. The denial of truth is an injustice. And injustice amounts to misery. It is this misery that we should avoid. It is this misery that I contemplated starkly that sleepless night without realizing fully its cause. It is the misery of untruth: happiness lost and freedom squandered. The misery of sufferings lived as though meaningless. The great loneliness of those left to wallow in their weakness without being offered that charity that seeks their truest good over and beyond their comfort. It is the misery that divides mercy and truth, separating love and crushing a daring hope. It is the misery that forgets the rose is both a stem of pain and the bloom of grace. It is the paralysis that sets in once we sever happiness from its demands, and freedom from its roots in truth. In this misery we falter farther and further from the freedom promised by the truth. We seek antidotes to our loneliness in all the wrong places: a vicious cycle of dependence and delusion. And so before the dawn placed a first light into an urban panorama of solitude, it dawned on me that this marriage thing these days is hard as hell. And that few people perhaps realize how exactly hard it is. And that it is necessarily just and fair that someone tell the difficult truth. Because it is hard as hell to marry when we do not know what marriage is. Hard as hell to unite what is interiorly disjointed and alone. Hard as hell to confront one’s own sin when few believe it even matters. Hard as hell to realize that more is at stake in marital union than one can even imagine. Hard as hell to believe holiness is possible when we no longer believe holiness is real. Hard as hell to imagine that we might be responsible for holiness unattained. Hard as hell to love when love is hard to believe in, or when it betrays. Hard as hell to love when love asks for all; hard as hell to persevere when freedom seems the easy way out of misery. Hard as hell to choose a life of unity, because we are sold unity staked on broken promises. Hard as hell to face the prospect of failure with no one bold enough to say we need to change course and illumine the way. Hard as hell to be told that all is well and we will be fine, when well and fine mean nothing. Hard as hell to face real suffering alone. Hard as hell to raise a family when the culture rejects the idea that family matters. Hard as hell to look for that look of mercy that sets the wrong aright by speaking the truth that hurts. Hard as hell to desire a good one cannot have. Hard as hell to be one flesh when we are not one soul. Because it is hard as hell to face the Cross. And believe its promise true. The best defense of marriage is a defense of reality. Reality is the true defense. Only from the reality of the thorn can it be possible to believe the glory of the rose. It is from living reality that we daily assent to the truth of a love made holy in the ordinariness of daily life: in its tedious tasks and passing joys, its struggles and betrayals, in its fruitful moments, and even to its last gasps in death. In all this we assent to the reality of a love that requires the best of us and mends the worst of us. We set forth a path that makes sense, because it is revealed in the clarity of truth. Greater love has no man than this, that a man lay down his life for his friends. …Lay down his life. We can now call love a bold mercy. The reason for our hope is anchored in reality of so bold a mercy. A mercy that gives all for love, one though which forgiveness is lavished, and heroic virtue is possible over and over again. The reason for our hope is anchored in the reality that our insufficiency, and weakness, and loneliness are real, and that the victory has been won in the Cross. Such is the bold Christian response to a culture whose standards of mediocrity amount to sheer hopelessness; whose defense for the failure of charity amounts already to the reality of hell. From the fusion of modern hopelessness to a newly purified faith we discover what love is capable of: how much it can endure, how much it can grow — what love makes of hell itself. We discover the eternal gaudium of the love of God. We discover a gladdened suffering, a capacity for union that resists division, a frailty emboldened, the pleasure of purity of heart and of body, a loneliness not replaced with easy thrills — but lived together and in peace. We discover that crossing into a promised land is possible even now. For God is love. Our love follows on the standard that has already been established — a cruciform hope is born anew, and as we raise it for the world to see, the sea is parted before us even still. Truth is a mercy — however severe. And from this clarity of truth comes the first dawn of hope, and the first hope of joy. We find in it a contrast to hell. This marriage thing is livable because it is holy. This marriage thing is joyful, because it demands all, when everyone around us demands little or nothing. This marriage thing is fulfilling, because it is staked on One in whose parting words we are called to a love that gives even to one’s life. 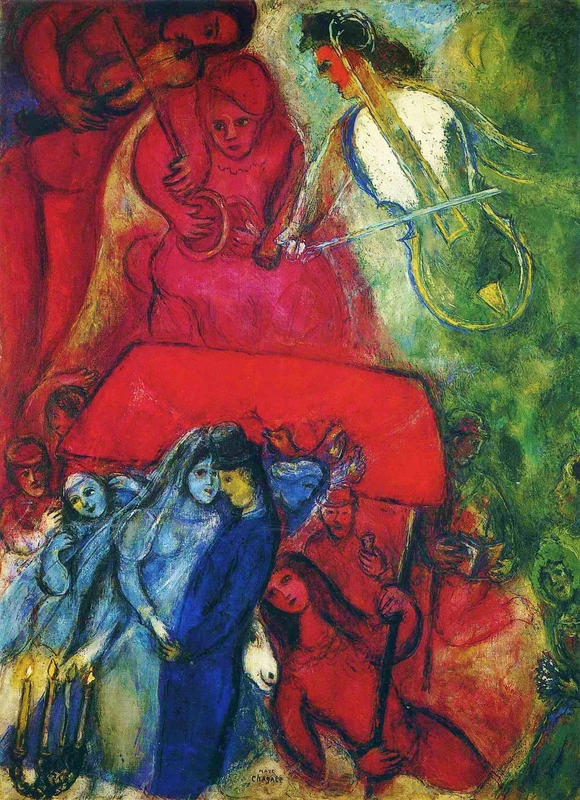 Like Raïssa beholding a Chagall, we can say again: did God not forewarn us? Did He not take the trouble to tell us what love looks like, first through the prophets, and finally through His Incarnate Son? Did He not give us a model? For I have given you an example, that you also should do as I have done to you. Those words did not expire. They resonate against the wailing of a culture mired in a canopy of confusion. They are inscribed on every soul washed clean in Holy Baptism, and preciously bound in the holy sacrament of love where two become one soul, one flesh. The example of selfless love — the standard of freedom — is posed first by the Cross. There is a reason we have a Nuptial Mass. The walk up the aisle that begins the nuptial rite is not a singular experience. It is once the walk to the altar of sacrifice, and always a walk towards the altar of sacrifice. It remains even now as epic as that crossing of the Red Sea which preceded the one ascent to Calvary. Yes, we do this also in remembrance of Him. In remembrance of the love Christ showed for His Bride. Beloved, let us love one another; for love is of God, and he who loves is born of God and knows God. He who does not love does not know God; for God is love. In this the love of God was made manifest among us, that God sent his only Son into the world, so that we might live through him. In this is love, not that we loved God but that he loved us and sent his Son to be the expiation for our sins. Beloved, if God so loved us, we also ought to love one another. No man has ever seen God; if we love one another, God abides in us and his love is perfected in us. By this we know that we abide in him and he in us, because he has given us of his own Spirit. And we have seen and testify that the Father has sent his Son as the Savior of the world. Whoever confesses that Jesus is the Son of God, God abides in him, and he in God. So we know and believe the love God has for us. God is love, and he who abides in love abides in God, and God abides in him. In this is love perfected with us, that we may have confidence for the day of judgment, because as he is so are we in this world. There is no fear in love, but perfect love casts out fear. For fear has to do with punishment, and he who fears is not perfected in love. We love, because he first loved us. We love because He first loved us. And that was as hard as conquering, yes, even hell. Such is the victory that dispels the darkness — dries the tears cried even as of olden wedding nights. If God so loved us, we also ought to love one another. …We know all of these things, even we who live in a secular world, but are bathed each day in the living waters of grace. We know these things. We know reality — the merciful truth that transforms hell into paradise, and resurrects this marriage thing, making it … beautiful. This post is a sequel to Matrimony From The Ruins | A Lament For Pastoral Change We Can Believe In, and The Tragic Way of Matrimony. It is dedicated to those in difficult marriages, or whose marriages have otherwise ended in divorce, with prayers.